Get your line in the tree with our complete arborist throw line kits. When you buy a throw line kit, you get your throw line of choice, storage bag, throw weight, and save money versus buying the components individually. WesSpur stocks a variety of arborist throw lines for installing a climbing line or friction saver in a tree. You'll find inexpensive throw lines like Slick Line or Target Line as well as high-strength and high-performance throw lines like Jet Set, DynaGlide, and Zing-It, and Petzl's Airline. All throw lines will perform best when “flaked” into a throw line cube or storage bag, so that each line segment lays atop another, and should never be coiled (unless you LIKE spending an hour untangling your throw line). High-performance throw lines like Zing-It, Jet Set, and DynaGlide are the best choices to use with the Tru-Shot Line Launcher. This super-packed kit gives you the ultimate selection of throw line tools to establish your personal favorites and make sure you've got plenty of backups and alternate tools for every situation! Kit contains: Tru-Shot with 4' poles (THR302), Petzl Eclipse folding cube (BAG123), 180' x 1.75mm Zing-It Throw Line (THR101-B), 196' Petzl Airline (THR136), 200' Dynaglide Throw Line (THR119), Climb Right 10oz, 12oz, & 14oz Cordura throw bags (THR233, THR234 & THR236), Petzl 9oz, 10.5oz, & 12.5oz throw bags (THR225, THR226, THR227). This throw line kit combines cube, weights, throw line and adjustable friction saver into one handy, price-saving package. Recommended starter set. Contains: WesSpur Throw Line Cube (BAG113), 10 oz Throw Weight, 12 oz Throw Weight, 180' Zing-It 1.75mm Throw Line (THR101), 4' Adjustable Friction Saver (CLI249). 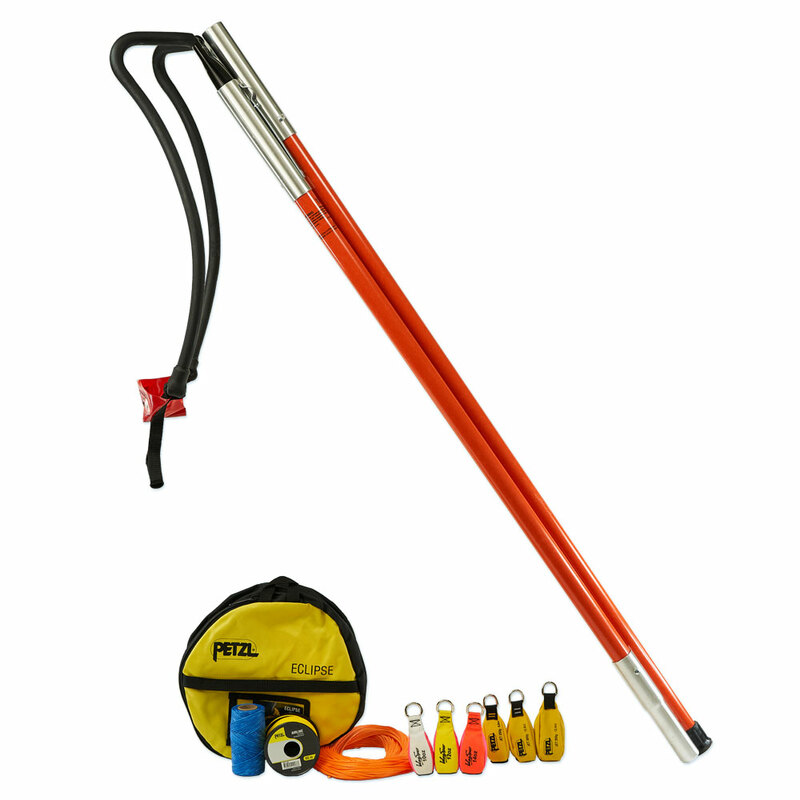 Kit comes with 60 meters of Petzl Airline Throwline, Eclipse throw line storage system, and Jet throw weight of your choice. Kit comes with your choice of 180’ of Samson Zing-It 1.75 mm or 2.2 mm line, one 10 oz and one 12 oz throw weight, and WesSpur throw line cube (BAG113). Zing-it is made from Dyneema fiber, and yields the highest strength, lightest weight, lowest stretch and longest wear life available. Samthane coating adds wear life and ensures the knot-holding capability. 1.75 mm line has 400 lb average strength, 2.2 mm is rated at 580 lb average strength. Kit comes with your choice of 180’ of Jet Set 1.75 mm or 2.2 mm line, one 12 oz and one 14 oz throw weight, and light duty throw line storage cube (BAG113). Jet Set is made from 100‰ Spectra fiber and designed for long flights and to avoid snagging. Light weight makes it great for use with the Tru-Shot Line Launcher, and the square cross-section of the line lets it slip through the canopy easier. 1.75 mm line has 450 lb average strength, 2.2 mm is rated at 650 lb average strength. Kit comes with your choice of 150’ or 200’ of DynaGlide throw line, one 10 oz and one 12 oz throw weight, and WesSpur folding throw line cube. Kit comes with 164' of Marlow Excel throw line, one 12 oz and one 14 oz throw weight, and folding throw line cube. Kit comes with 180’ of Samson Zing-It 1.75 mm line, choice of throw weight, and throw line storage bag. Zing-it is made from Dyneema fiber, and yields the highest strength, lightest weight, lowest stretch and longest wear life available. Samthane coating adds wear life and ensures the knot-holding capability. 1.75 mm line has 400 lb average strength. Bag colors may vary. Leave us a note in the comments field to request a specific color. Kit comes with 180’ of Samson Zing-It 2.2 mm line, choice of throw weight, and throw line storage bag. Zing-it is made from Dyneema fiber, and yields the highest strength, lightest weight, lowest stretch and longest wear life available. Samthane coating adds wear life and ensures the knot-holding capability. 2.20mm has 580 lb average strength. Kit comes with 150’ of Marlow Excel, throw line storage bag, and your choice of throw weight. We recommend the 16 oz weight to help pull the thicker line through the tree.